The unique identifying number provided for every single phone enables text messages and phone calls to reach individuals wherever they are situated. A similar cell principle has been used by researchers from the Georgia Institute of Technology to track cells sorted on microfluidic chips. In the new method, a simple circuit pattern comprising of just three electrodes is used to allocate a novel seven-bit digital identification number to every single cell traveling through the channels existing on the microfluidic chip. The method also collects information about the sizes of the cells and their rapid movement. It is possible for that information and identification to allow automated counting and examination of the cells being organized. A report on this research has been published in Lab on a Chip, and could offer the electronic intelligence could permit cost-effective labs on a chip to carry out refined medical testing outside the boundaries of clinics and hospitals. The new technique is capable of tracking cells with more that 90% precision in a four-channel chip. We are digitizing information about the sorting done on a microfluidic chip. By combining microfluidics, electronics and telecommunications principles, we believe this will help address a significant challenge on the output side of lab-on-a-chip technology. Microfluidic chips utilize novel biochemical and biophysical properties of viruses and cells to separate them. It is possible to use antigens to select cancer cells or bacteria and then direct them into separate channels. Optical methods can now be used to count the cells in order to gain information about the location of the cells. The new method, dubbed microfluidic CODES, introduces a grid of micron-scale electrical circuitry under the microfluidic chip. An electrical field in the microfluidic channels on top of the grid is developed by the current passing through the circuitry. When a cell travels through one of the microfluidic channels, it forms an impedance change in the circuitry that is responsible for signaling the passage of the cells and providing details about the location of the cell, cell size, and the rate at which it passes through the channel. For several years, this impedance change has been utilized to identify the existence of cells in a fluid, and is the core for the Coulter Counter, which facilitated reliable and rapid blood counts. However, the microfluidic CODES method goes beyond counting. The negative and positive charges from the intermingled electrical circuits develop a novel identifying digital signal as every single cell flows by, and that sequence of zeroes and ones is fixed to details regarding the impedance change. It is possible to divide and read the identifying signals from several cells with the help of a computer, and this allows scientist to trace the properties of the cells, and also find out the number of cells that have traveled across each channel. By judiciously aligning the grid pattern, we can generate the codes at the locations we choose when the cells pass by. By measuring the current conduction in the whole system, we can identify when a cell passes by each location. The new method allows the automated detection of bacteria, cancer cells, or even viruses present in a fluid sample. Sarioglu and his students have illustrated the possibility of tracing over a thousand ovarian cancer cells with a precision rate exceeding 90%. Code division multiple access (CDMA) is the fundamental principle used for cell identification, and it plays a vital role in helping cellular networks segregate the signals from every single user. Fabrication of the microfluidic channels from a plastic material is carried with the help of soft lithographic techniques. The electrical pattern is separately fabricated on a glass substrate, and then positioned with the plastic chip. We have created an electronic sensor without any active components. It’s just a layer of metal, cleverly patterned. The cells and the metallic layer work together to generate digital signals in the same way that cellular telephone networks keep track of each caller’s identity. 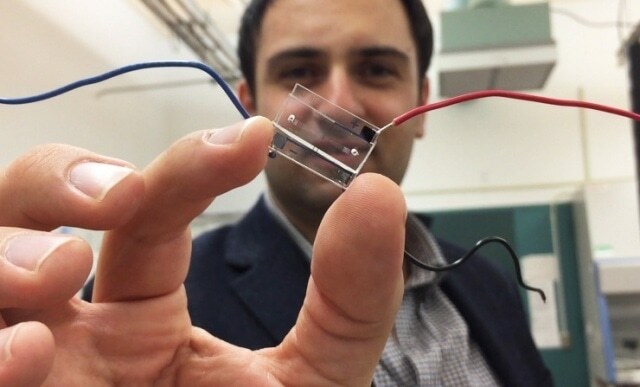 We are creating the equivalent of a cellphone network on a microfluidic chip. Moving forward, the researchers plan to incorporate the electronic sensor with a microfluidic chip capable of sorting cells in an active manner. Beyond viruses, bacteria, and cancer cells, this sort of a system can also categorize and examine inorganic particles. The computing demands of the system will be minimal, requiring no more than the smartphone’s processor power, which previously helped decoding of CDMA signals. The proof-of-principle device comprises of four channels, but Sarioglu assumes that more channels can be added by easily scaling up the design. This is like putting a USB port on a microfluidic chip. Our technique could turn all of the microfluidic manipulations that are happening on the chip into quantitative data related to diagnostic measurements. Finally, the researchers are planning to develop cost-effective chips capable of being used for refined diagnostic testing in remote locations or physician offices. Chips can also be contained on cartridges that will help automate the testing process. It will be very exciting to scale this up, and I think that will open up the possibility for many different assays to become accessible electronically. Decentralizing health care is an important trend, and our technology might one day allow many kinds of diagnostic tests to be done beyond hospitals and large medical facilities. Other co-authors of the paper included Georgia Tech graduate students Ruxiu Liu, Ningquan Wang, and Farhan Kamili.